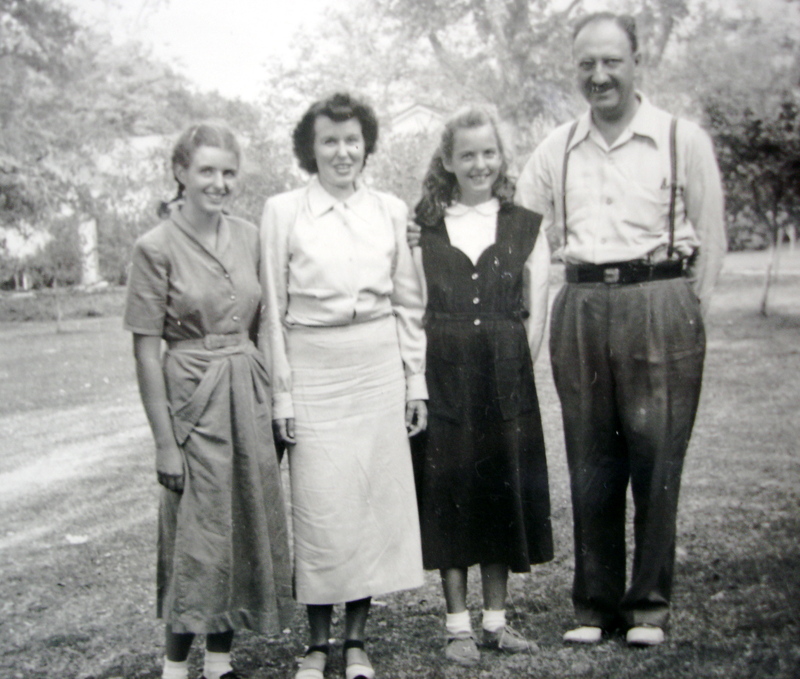 My sister, mother, me, my father, c. 1952. Have you ever wondered about the difference between who you are and who you’re pretending to be? I’m searching my earliest memories, when my environment had the least impact on me, to help me find out. • My love of music goes back forever. I had to have been born with it. This points to preferring the feeling side of life—the arts, beauty, people, psychology, etc. There’s not much argument against the MBTITM preferences (introversion and extraversion, feeling and thinking, for example) being inborn; I believe I’ve also been individualistic, focused on possibilities, and empathic from the beginning. • When my older sister and my mother screamed at each other, did I freak out and cringe behind the closed door because I naturally disliked conflict? Or did I dislike conflict because their screaming traumatized me? I think I have the anti-conflict gene, if there is such a thing, which Enneagram 9-Peace Seekers and 5-Observers (my type) share. I thrive on peace and dislike drama in my life. • Football players and wrestlers like rough contact, even getting hurt, and don’t usually mind trading insults. This is not the real me for sure! I’m as far as one can get from typical players of contact sports, often 8-Asserters in the Enneagram. • Are you too lazy to spend 55 minutes beautifying yourself every day, as the average woman does? My mother, a 2-Helper, wasn’t. She put on lipstick, powder, rouge, and eye makeup every day, finishing by brushing mascara on her two or three white hairs as a quick cover up. She never allowed me to touch her shiny auburn hair. When I see apes bond by running their fingers through each other’s hair, looking for dirt and parasites, the feeling of disappointment comes back. My mother’s interest in her appearance influenced my attitude. I’m not totally lacking in vanity, but I don’t spend much time on it. • Whenever my mother and I passed through the huge main doors of ZCMI, the big department store in Salt Lake City, she would beeline it to the nearest set of mirrors. We could not talk until she was satisfied with her lipstick, powder, and the angle of her hat. Every so often she’d spot another mirror and recheck herself. Would my mother be as interested in mirrors if she happened to be ugly instead of pretty? Wondering this led me to thinking it would be fairer if humans didn’t have bodies. I wished we could be spirits and relate to one another purely from our inner selves, a wish I almost forgot about when puberty set in. • My father, a 5-Observer and a scientist, was a role model to me for thinking logically—and he did not suffer fools gladly. I’m thankful I picked up his respect for the intellect, but maybe I tricked myself into thinking I could also be strong and smart like him if I were more critical of others. Being like him would compensate for feeling weak. Now, however, I am more interested in being kind than in one-upping anyone. Being true to my real self by being empathic beats having a false sense of strength. Visit The Happy Introvert – a Wild and Crazy Guide for Celebrating Your True Self on Facebook.